custom-themes.jpg​ (20.3 KB) - added by Presskopp 3 years ago. button.jpg​ (26.8 KB) - added by Presskopp 3 years ago. 37527.diff​ (367 bytes) - added by Presskopp 3 years ago. 37527.2.diff​ (402 bytes) - added by afercia 3 years ago. +1 to adding an underline in these cases. It's always better to be clear what is a link or not. 1) Should the theme-author be underlined, too? We should avoid making any <button>s that look like links look more like links. Instead, I think we need to come up with a standardized ternary button style to be used for thinks like the widget close and remove links. 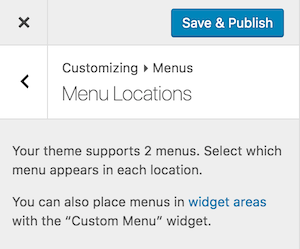 These are lower in hierarchy than the secondary buttons near them because the only primary button in the customizer is save & publish. This style may look similar to a link, but I'd like to avoid underlines if possible so that they aren't confused with actual links. 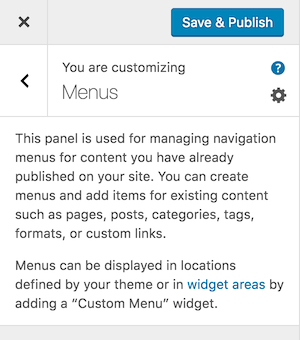 Note that there is a link within the menu item control that should be styled like a link (this navigates the preview to the linked URL). External links (which absolutely must open in a new tab in the customizer, and can have visual and screen reader indications of that behavior) should look like links, with underlines (including the author links). 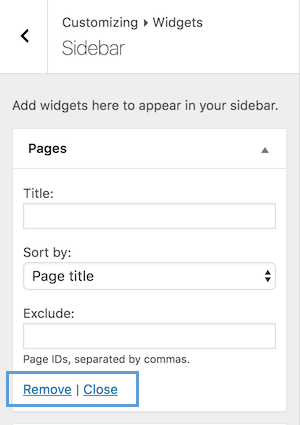 Internal links that link to another section (such as widget area) should probably also look like link, with underlines, especially in the context of a larger piece of text such as a description. 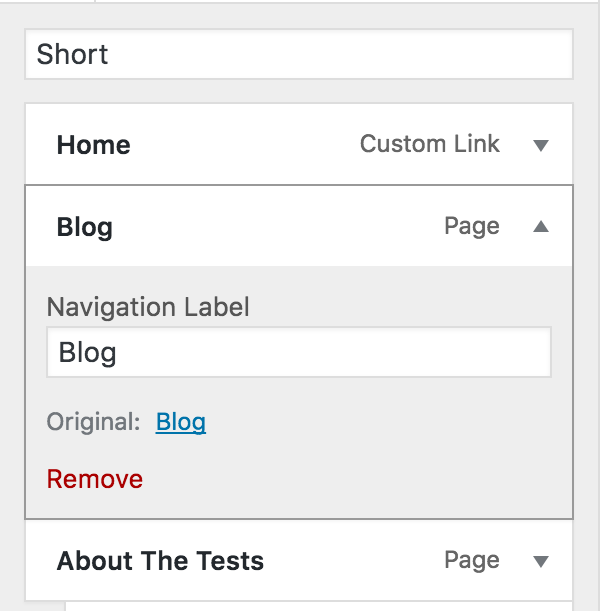 However, I'm not convinced that navigating to other parts of the customizer is a "linking" action, and buttons are probably a more semantic option here where appropriate. We should get some UX feedback on whether in-customizer navigation is better described by buttons or links before making a final decision. I agree, and I'm not entirely convinced they should look like links at all. Instead, I think we need to come up with a standardized ternary button style to be used for thinks like the widget close and remove links. I kindly disagree. Until they're <a> elements, they should look like links. If agreed they behave more like buttons then it would be more appropriate to mark them up as <button> elements, this also applies to other places in the Customizer where UI controls still use a not ideal markup and in some cases still use things like <span> elements. Refreshed patch with a minimal, and reversed approach. Still thinking the best option would be keeping the <a> elements underlined by default, and then override the style case by case. That's because many of these links that are not real links should be changed in buttons sooner or later. Haven't touched the widget action links. Worth noting there are still some small inconsistencies here and there. For example, the "Delete Menu" button-link is underlined while the "Remove" menu item button-link is not underlined. Not sure why, would be nice to review them. @celloexpressions do you feel this is a viable approach? I think this makes sense, and since the patch is simple, I'm fine with 37527.2.diff​ being committed and then leaving the ticket open for a few weeks to track any issues that come up. The remove/delete buttons should not be underlined since they aren't links; however, the decision was made to explicitly underline the delete menu button at one point. We can continue working toward consistency here as we notice issues. Accessibility: Make links in the Customizer underlined by default. can be handled on a case-by-case basis. Props Presskopp for the initial patch. and then leaving the ticket open for a few weeks to track any issues that come up. Conversation can continue on closed tickets :) feel free to reopen at any time if you notice issues to address. Customize: Prevent removal of underline upon hover/focus for nav menu deletion links.